And then I click a save button to do a patch request, and the console.log(state) in the above action gives undefined. I don’t know how to fix that. Any help is appreciated. Thanks. Try exporting each constant as part of the default, rather than individually… and as default. I imagine that’d cause an issue. Errrrr. It was something totally unrelated actually. So, I’ve no idea why the console.log was saying that the state was undefined, but I was getting an error from my endpoint because the guid was not being added. 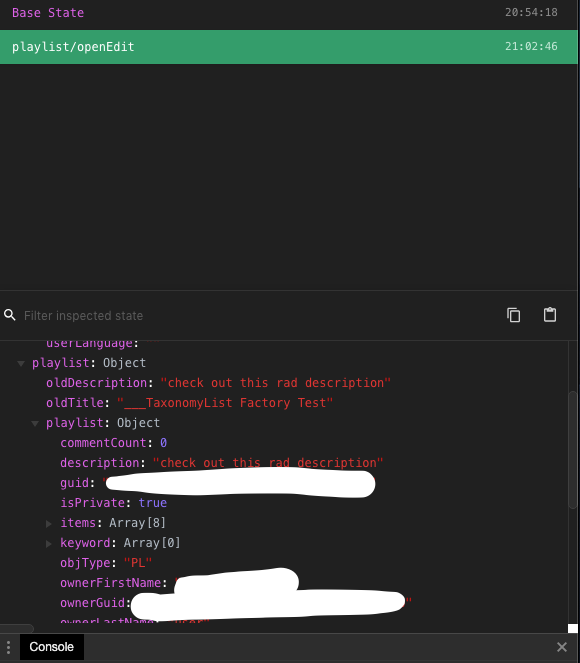 Well, turns out that I wasn’t adding the guid in the PlaylistService.update function definition itself, even though I was sending the guid in.